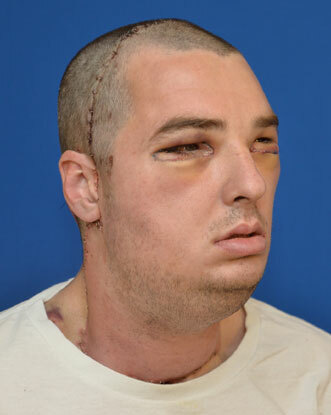 (CBS/AP) A 37-year-old Virginia man injured in a 1997 gun accident has been given a new face, teeth, tongue and jaw in what University of Maryland physicians say is the most extensive face transplant ever performed. University of Maryland Medical Center officials announced Tuesday that Richard Lee Norris of Hillsville is recovering well after last week's surgery, beginning to feel his face and already brushing his teeth and shaving. He's also regained his sense of smell, which he had lost after the accident. Face transplant surgery: How are patients now? Norris has spent the past 15 years living as a recluse, and the transplant will give him his life back, said lead surgeon Dr. Eduardo Rodriguez, associate professor of surgery at the University of Maryland Medical Center. "It's a surreal experience to look at him. It's hard not to stare. Before, people used to stare at Richard because he wore a mask and they wanted to see the deformity," Rodriguez said. "Now, they have another reason to stare at him, and it's really amazing." It was the 23rd face transplant since doctors began doing the procedure seven years ago. The 36-hour operation was the most extensive because it included transplantation of the teeth, tongue, upper and lower jaw and all facial tissue from the scalp to the base of the neck, Rodriguez said. Because it included so much facial tissue, the incisions are farther back and less visible, he said. CBS News station WUSA in Washington D.C. reported a team of over 150 nurses and medical staff were involved in the procedure. The first full face transplant was performed in France in 2005 on a woman who was mauled by her dog. The Cleveland Clinic performed the first face transplant in the U.S. in 2008. Last year doctors at Brigham and Women's Hospital in Boston performed three full face transplants. The first full face transplant in the U.S. was performed on Dallas Wiens, a 26-year-old Texas man who accidentally struck a power line when painting a church. Less than a month later, surgeons at BWH performed a full face transplant on 30-year-old Mitch Hunter of Indiana, who was disfigured after an auto accident. Then Charla Nash, who made headlines when her neighbor's chimpanzee mauled her, underwent the procedure at the hospital in May. All three are well on their way to recovery, HealthPopreported. The University of Maryland's research on transplants was funded by a grant from the Office of Naval Research, and doctors said they hope to begin operating soon on military patients. Officials provided little detail on Norris' personal life. WUSA reported that Norris was injured in 1997 in a gun accident. He graduated from high school in his small southwest Virginia hometown in 1993 and was employed at the time of the accident. Since then, he has lived with his parents and has not had a full-time job, Rodriguez said. WUSA said Norris has had multiple life-saving and reconstructive surgeries. Because of the accident he lost lips and nose, and has very limited movement of his mouth.